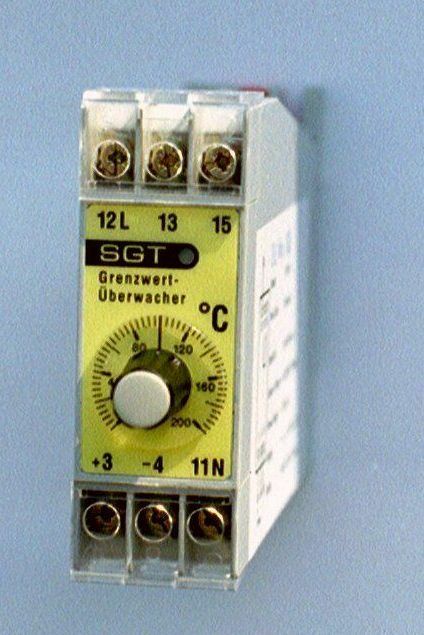 The areas of application for safety temperature limiters SGT or SGW are wherever thermal processes need to be monitored, and where the system must be set to a safe condition in the event of a fault. If the permitted temperature limit is reached or a fault occurs within the permitted temperature range then the instrument switches off. For mounting on 35mm rail DIN EN 50022-35 or by screws. Price per unit: € (Euro) 100,- without TVA. Dimensions: 25 x 70 x 122 mm (B x L x H). Zulässiger Anwendungsbereich: working temperature: -10°C...+60°C. Power supply: Standard: 230V ac; (auf Wunsch 115V ac, 24 Volt ac) +/- 10% 48-62 Hz. If the working value is becoming more than the "max." X > = W (LED changes from green to red).